Illinois drivers run or “roll” through stop signs daily and while oftentimes nothing happens, sometimes severe accidents can result. At the Law Office of Adrian Murati, our Rockford personal injury firm stands up for individuals injured in stop sign accidents. If you or a loved one have been injured at a stop sign intersection, then we can help you deal with the insurance company so you can get your car fixed, your medical bills paid, and lost wages for anytime you missed at work while recovering. Call us at (815) 289-3209 to discuss your case with a Rockford car accident attorney. Under 625 ILCS 5/11-904, drivers approaching a stop sign intersection must stop at the clearly marked stop line. If there is no line, then drivers must stop at the point nearest the intersection where the driver has a view of approaching traffic on the intersecting roadway. After stopping, the driver must yield the right-of-way to any other vehicles that entered the intersection before that driver. Inattention: The worse stop sign collisions happen when another driver recklessly, carelessly, or negligently, drives through a stop sign without noticing it. Completely “running” a stop sign often leads to serious crashes with other vehicles that had the right-of-way to drive through the intersection. Mistaken Right-of-Way: When two drivers believe they each have the right of way and both accelerate past their stop signs and crash into each other. Driver Error: Sometimes drivers mistake a two-way stop sign intersection as being a four-way or all-way stop, and the driver attempts to pass at the same time another vehicle who doesn’t have a stop is passing. Obstruction: The stop sign is blocked, obstructed, or otherwise obscured by trees, bushes, a parked or stopped truck, graffiti, twisted the wrong way by kids, or some other cause. Newly Installed Stop Sign: Drivers may not notice newly installed stop signs on a road they frequently travel on. Weather: Severe weather such as snow, sleet, hail, and rain, may obscure a driver’s vision and cause them to miss a stop sign. Sunny weather can have the same effect. No matter what type of negligence caused your stop sign accident, you can have peace-of-mind knowing that the Law Office of Adrian Murati will stand up for your rights and work to hold the at-fault driver accountable. If another driver runs a stop sign and hits your vehicle, you still need to prove fault to recover compensation for damages to your vehicle and medical expenses from the insurance company. Oftentimes, the other driver will claim that you were the one that actually ran the stop sign and a complicated he-said-she-said dispute can ensue. Without sufficient evidence, the insurance company will likely deny the claim and might even advise the other driver to bring a lawsuit against you. 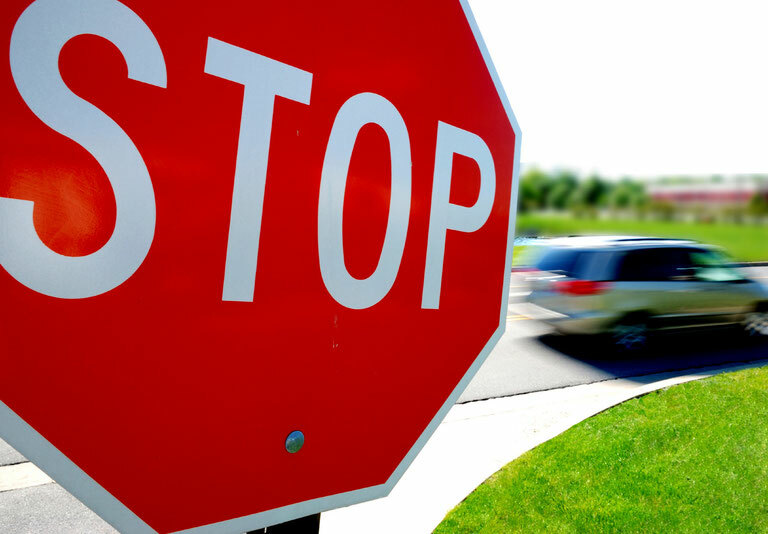 Gathering evidence is essential to recovering compensation for your stop sign accident claim. Evidence can include photographs, witness testimony, police statements, and video surveillance from nearby storefronts with street view cameras. If you or a loved one have suffered injuries at a stop sign intersection due to someone else’s carelessness or reckless driving, our Rockford personal injury law firm can help you prove the other driver was at fault and file a legal claim to receive compensation for injuries. Call the Law Office of Adrian Murati at (815) 289-3209 to speak with a car accident attorney about your case. And remember, we don’t get paid unless you get paid.